We herein present a clinical case, radiology, and discussion of asymptomatic middle cranial fossa arachnoid cyst in a 15-year-old male child who presented with raised intracranial features following a trivial trauma. 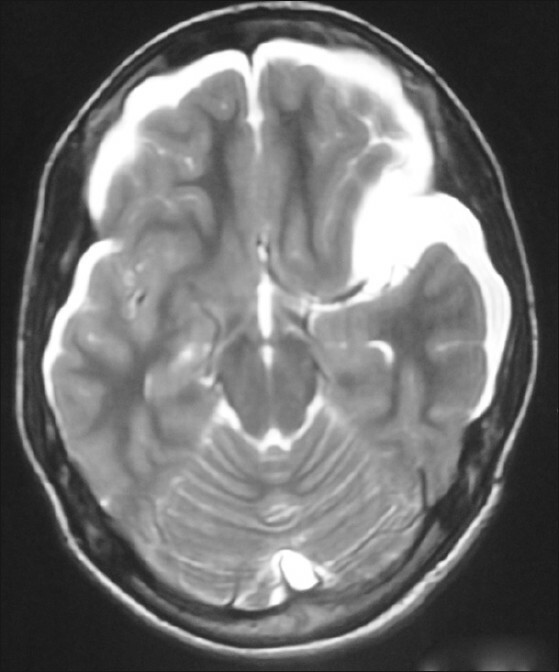 A 15-year-old male child presented with complaints of headache, visual blurring, and projectile vomiting for 20 days duration. The child had a history of trivial fall about 10 days prior to onset of headache, with no loss of consciousness. On examination, the child had bilateral florid papilledema and right lateral rectus palsy. There were no other focal deficits or signs of meningeal irritation. 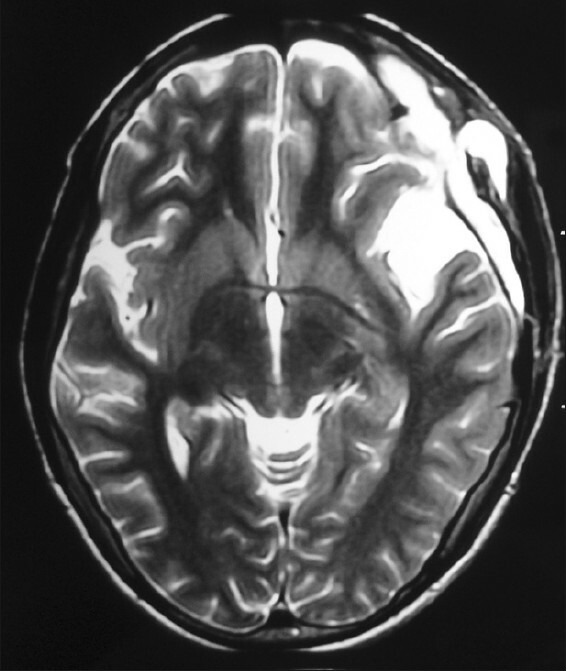 Computed tomography (CT) scan of the brain showed a left middle fossa, Galassi type 3 arachnoid cyst, with bilateral subdural hygroma/hematoma (chronic), bilateral diffuse cerebral edema, and mass effect causing compression of both frontal horns [Figure 1]. Magnetic Resonance Imaging (MRI) of the brain showed bilateral collection in the subdural space, hypo on T1W [Figure 2] and hyper on T2W [Figure 3] images, matching with the intensities of Cerebrospinal Fluid (CSF) with widened Sylvian fissure on the left side and a compressed temporal lobe on the left side, suggestive of arachnoid cyst with subdural hygroma and mass effect. Left pterional craniotomy, evacuation of hygroma, fenestration of cyst into suprasellar cistern, and marsupialisation of the cyst was performed. The patient developed pseudomeningocele, which was managed with lumbar CSF drainage for 5 days and was discharged without any deficits. 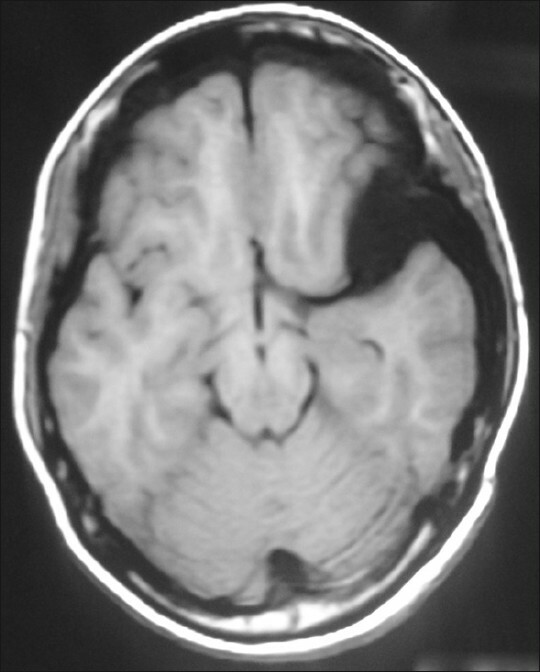 The postoperative imaging showed resolution of the subdural hygroma with small extradural and subgaleal collection of the CSF [Figure 4]. Arachnoid cysts are considered intra-arachnoidal in location and account for 1% of the intracranial mass lesions. They can develop anywhere in the cerebrospinal axis but have a predilection toward the middle cranial base. They are usually asymptomatic, but may present with raised intracranial pressure, focal neurologic deficits, or seizures. Being indolent and slowly growing, most of the arachnoid cysts can be managed conservatively, reserving surgical intervention for symptomatic lesions. Subdural rupture of the arachnoid cyst per se, ,, either traumatic or spontaneous, is sparingly reported with about 21 cases documented in literature. Even a minor trauma can cause rupture of the cyst as seen in the present case, where the patient fell down while playing, without any loss of consciousness. The gradual seepage of the CSF from the cyst into the subdural space, probably through a "flap- valve" effect,  caused a gradual rise in the intracranial pressure. Ruptures are usually asymptomatic in areas other than the cysts in the middle cranial fossa. The procedures described in the literature vary from subgaleal drainage to cystocisternal fenestration. However, immediate operative intervention was warranted in view of raised intracranial pressure and progressive neurologic deterioration. 1. Helland CA, Wester K. A population-based study of intracranial arachnoid cysts: Clinical and neuroimaging outcomes following surgical cyst decompression in children. J Neurosurg Pediatr 2006;105:385-90. 2. Inoue T, Matsushima T, Tashima S, Fukui M, Hasuo K. Spontaneous disappearance of a middle cranial fossa arachnoid cyst associated with subdural hematoma. Surg Neurol 1987;28:447-50. 3. Eustace S, Toland J, Stack J. CT and MRI of arachnoid cysts with complicating intracystic and subdural haemorrhage. J Comput Assist Tomogr 1992;16:995-7. 4. Cakir E, Kayhankuzeyli, Sayin OC, Peksoylu B, Karaarslan G. Arachnoid cyst rupture with subdural hygroma-Case report and literature review. Neurocirugia (Astur) 2003;14:72-5. 5. Cullis PA, Gilroy J. Arachnoid cyst with rupture into the subdural space. J Neurol Neurosurg Psychiatry 1983;46:454-6. 6. Offiah C, Clair F, Thorne J. 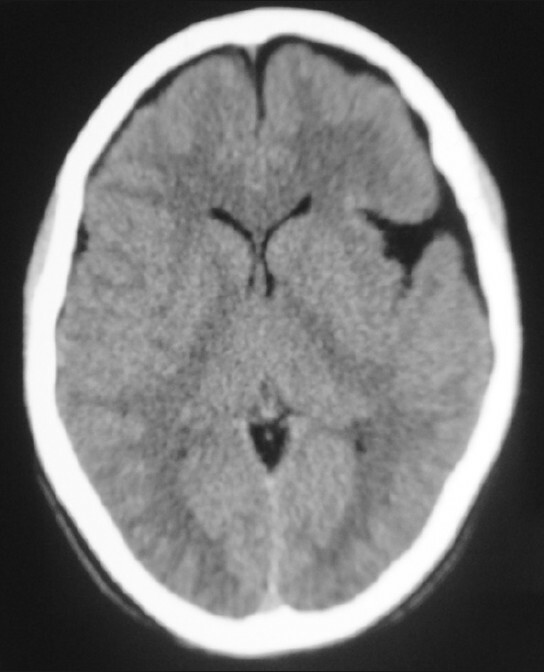 Non hemorrhagic subdural collection complicating rupture of middle cranial fossa arachnoid cyst. Br J Radiol 2006;79:79-82. 7. Cokluk C, Senel A, Celik F, Ergur H. Spontaneous disappearance of two asymptomatic arachnoid cysts in two different locations. Minim Invasive Neurosurg 2003;46:110-2. 8. Rakier A, Feinsod M. Gradual resolution of an arachnoid cyst after spontaneous rupture into the subdural space. J Neurosurg 1995;83:1085-6.